Yesterday we discussed what not to worry about, so today let’s take a look at what we, as investors, should be worrying about. In short, that would be a long-lived, substantial decline in the stock market—otherwise known as a bear market. A bear market, especially one that lasts a long time, can turn a successful portfolio into a failure. It can do this quickly by imposing losses that make it impossible to generate the required income, which is particularly worrisome for investors in retirement. More slowly and subtly, it can scare investors out of the market permanently, sparing them the short-term pain but potentially ensuring long-term failure when the portfolio does not grow as much as needed. Bear markets are our enemy—financially, psychologically, and in every other way. We need to be wary of them. They do not, however, have to mean failure any more than occasional hurricanes make Florida uninhabitable (or, to be fair, that some terrible winters do the same for Massachusetts). Just like hurricanes, what bear markets require is planning, preparation, and some kind of warning system. 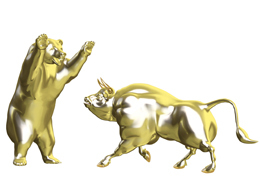 What would a bear market warning system entail? As a first step, let's see what developing bear markets have looked like over the past century. Here is a very good chart from J. P. Morgan that outlines just that. 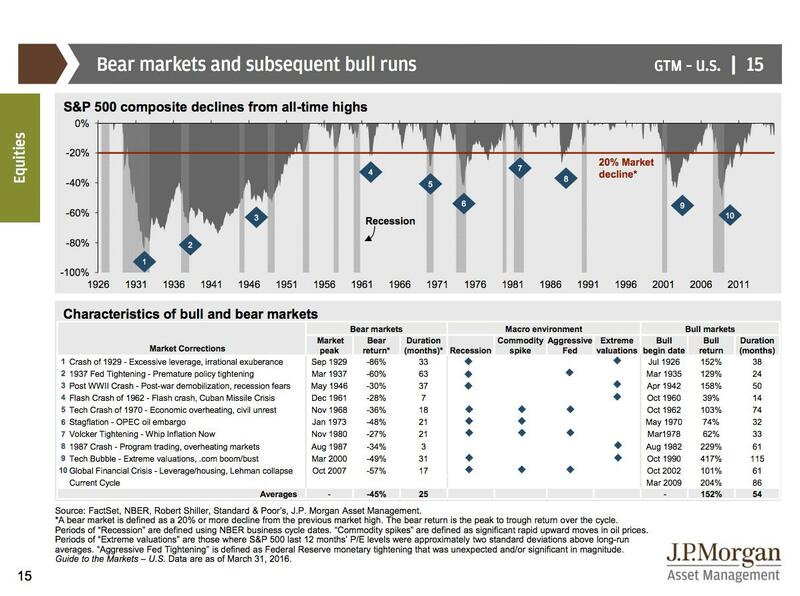 8 of the 10 bear markets were associated with recessions. 4 of the 10 were associated with commodity price spikes, the Fed raising interest rates, or both. 5 of the 10 were preceded by excessive valuation levels. These commonalities all make theoretical and intuitive sense. A recession cuts profits and slows growth, so the markets should adjust down. Ditto for commodity spikes. Rising interest rates make borrowing more expensive and generally can signal an economic slowdown before a recession. Finally, high valuations simply give stocks more room to drop; you get hurt much more by falling out a fifth-story window than one on the first story. These, then, are the factors we should be worrying about, with recession at the head of the list. This framework also gives some sense of whether the bear market will be short lived, even if severe, or whether it will drag on for a long time. Notably, the two events where there was no recession were much shorter lived than the other eight, and two other significant drawdowns since then, in 1998 and 2011, seem to confirm this. In other words, without a recession, we may see a significant pullback, but it is unlikely to be a 2000 or 2008 type of event that takes years to recover from. I call this the difference between a confidence bear (where the pullback is based on a loss of confidence that can pass quickly) and a crisis bear, which is likely to last long enough to do more significant damage. Confidence bears are worrying, but crisis bears are the real portfolio killers and what we should be most concerned about. Does this framework actually work? As a test, I used it during the first-quarter pullback to call for a limited and relatively short drawdown, which turned out to be correct. There does seem to be some real-time predictive power here, despite the limited data. At the very least, it’s a good starting point. The next step, of course, is to see if we can develop warning signs for the potential problem areas. Tomorrow, we'll start with the most important—recession—in the context of my monthly economic risk update.